Nestled among mature cottonwood trees, bordering the Snake River, this stately log home is a jewel of outdoor living and recreation. Overall site planning included a trail system that links multiple building sites and allows users to interact with the existing landscape as well as the extensive man-made wildlife habitat on the site. Use areas around the house where carefully planned to take advantage of the incredible Teton views. In line with the client’s goals, many of the outdoor use areas are very large, however, throughout the design process, we were able to add several intimate, quiet areas, that are comfortable for smaller groups. Our hardscape installation team showcased their talents while installing a sand-set paver auto court, pathways, terraces, as well as stone veneer landscape walls. 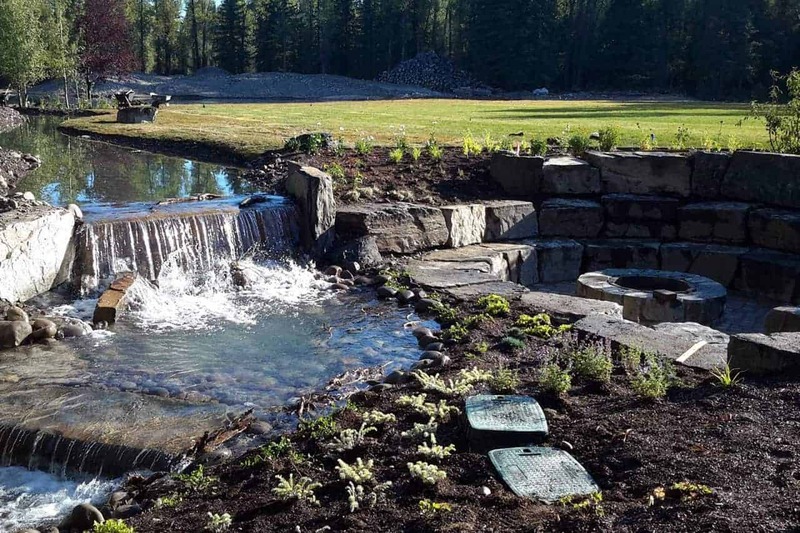 This project features a large natural stone fire pit area with amphitheater-style seating, a large fully functional outdoor kitchen complete with a wood-fired pizza oven, and a water future network that includes a pond and multiple streams with several small waterfalls.